Having covered the basics of location management in iOS 5 iPhone applications in the previous chapter it is now time to put theory into practice and work step-by-step through an example application. 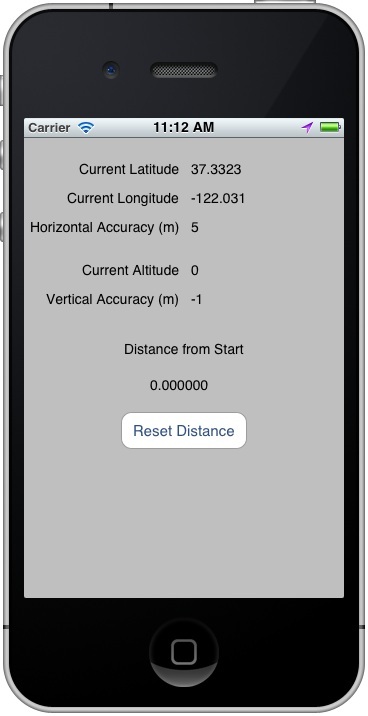 The objective of this chapter is to create a simple iOS application that tracks the latitude, longitude and altitude of an iPhone. In addition the level of location accuracy will be reported, together with the distance between a selected location and the current location of the device. The first step, as always, is to launch the Xcode environment and start a new project to contain the location application. Once Xcode is running, select the File -> New Project… menu option and configure a new iOS iPhone application named location with a matching class prefix using the Single View Application template. In order to access the location features of the iPhone the Core Location Framework must be included into the project. This can be achieved by selecting the product target entry from the project navigator panel (the top item named location) and clicking on the Build Phases tab in the main panel. In the Link Binary with Libraries section click on the ‘+’ button, select the CoreLocation.framework entry from the resulting panel and click on the Add button. Note the inclusion of the <CLLocationManagerDelegate> declaration in the above file. This is required to notify the compiler that the view controller class implements the Location Manager Delegate protocol. Having declared the outlets, the next step is to design the user interface. In the case of the five labels in the right hand column which will display location and accuracy data, make sure that the labels are stretched to the right until the blue margin guideline appears. The data will be displayed to multiple levels of decimal points requiring space beyond the default size of the label. Establish a connection between the latitude outlet declared in the view controller and the corresponding user interface label by Ctrl-clicking on the File’s Owner icon and dragging the blue line to the label located to the right of the Latitude label. Release the line and select the latitude outlet from the resulting menu. Repeat this task to establish outlet connections to the remaining six data display labels. The final step of the user interface design process is to connect the button object to the resetDistance action method. This is achieved by selecting the button in the view window and displaying the Connections Inspector window (View -> Utilities -> Show Connections Inspector). Click in the round circle to the right of the Touch Up Inside event and drag the line to the File’s Owner object. On releasing the mouse button, select the resetDistance method from the resulting menu. The above code creates a new CLLocationManager object instance and configures it to use the “best accuracy” setting. It then declares itself as the application delegate for the object. The location manager object is then instructed to begin updating location information via a call to the startUpdatingLocation method. Since location tracking has just begun at this point, the startLocation object is also set to nil. Despite the apparent length of the method it actually performs some very simple tasks. To begin with it extracts location and accuracy information from the newLocation CLLocation object passed through to the method as an argument. In each case, it creates an NSString object containing the extracted value and displays it on the corresponding user interface label. If this is the first time that the method has been called either since the application was launched or the user pressed the Reset Distance button, the locationDistance object is set to the current location. The distanceFromLocation method of the newLocation object is then called passing though the locationDistance object as an argument in order to calculate the distance between the two points. The result is then displayed on the distance label in the user interface. The action taken within this method is largely up to the application developer. The method, might, for example, simply display an alert to notify the user of the error. To experience the full functionality of the application it will be necessary to install it on a physical iPhone device, a process that is outlined in the chapter entitled Testing iOS 5 Apps on the iPhone – Developer Certificates and Provisioning Profiles. Once the application is running on an iPhone the location data will update as you change location with the device. One final point to note is that the distance data relates to the distance between two points, not the distance travelled. For example, if the device accompanies the user on a 10 mile trip that returns to the start location the distance will be displayed as 0 (since the start and end points are the same).